National Vitamin-A Plus campaign was observed on Saturday (today) across the country to feed vitamin-A Plus capsule to over 2.21 crore children aged between six months to 59 months to prevent childhood blindness and reduce child mortality. Under the campaign, children aged between six months and 11 months were given capsule with blue color while children aged between 12 and 59 months were administered red color capsule on the day, the Health and Family Welfare Ministry sources said. Health and Family Welfare Ministry sources said health workers and volunteers fed the vitamin-A Plus capsules from 1.20 lakh permanent and 20 thousand mobile centres across the country from 8 am to 4 pm. They added mobile centres were set up at bus stops, airports and launch terminals and other transport points to administer the children vitamin-A plus capsules. According to health experts, less than one percent children now suffer from blindness problem while the percentage of blindness for vitamin A deficiency was 3.74 in 1974. 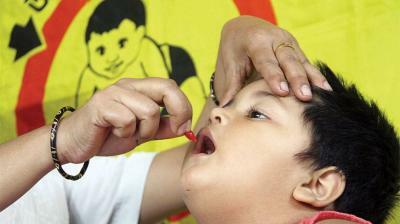 "With sincere efforts of the government, we have been able to reduce blindness problem," they added. The impact of vitamin-A deficiency is not limited to only blindness, the experts said adding it increases death risk by causing various diseases. "Vitamin A plus capsule was fed two times a year as it deposits up to six months in children's body. Alongside having vitamin A plus capsule, guardians should feed their children natural foods including vegetable and fish to avoid vitamin A deficiency," health experts added. Vitamin A is needed for children to prevent blindness problem as well as other diseases related to eye. Infants should be given breast milk within one hour of their births as it contains a large percentage of protein, mineral and vitamin, which greatly will help improve their immune system, they added.